Jesters Jackpot Video Slot Guide & Review - Casino Answers! Jester’s Jackpot is a 5-reel, 9-line video slot developed by Vegas Technology. 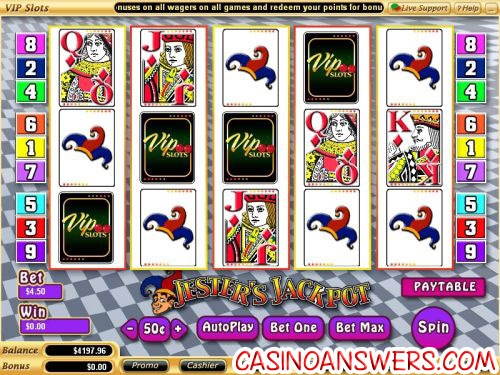 You can play the Jester’s Jackpot video slot game at USA-friendly online casinos VIP Slots Casino and Super Slots Casino. Bets on the Jester’s Jackpot video slot are $0.01, $0.05, $0.10, $0.25, $0.50, $1, $5 and $10 per line. You can select from 1-9 paylines on a spin in Jester’s Jackpot. 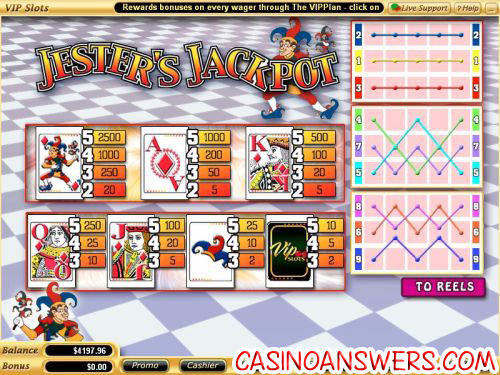 Jester’s Jackpot is a penny slot, thus it is very ideal for more casual slots players. You can bet from one cent up to the highest total bet of $90 per spin. To play all 9 lines on the Jester’s Jackpot slot machine, hit the “Bet Max” button. For other bets, select the number of lines you wish to play by hitting “Bet One” or by clicking on the numbers on the sides of the reels and then hit the “Spin” button. The highest paying symbol on the Jester’s Jackpot video slot is the Jester symbol. If you five of these symbols land on a selected payline, you will win the 2500 coin top jackpot. The Ace symbol is another high paying symbol. If you hit five of a kind with that symbol, you will win 1000 coins. You can win these top payouts by playing Jester’s Jackpot at VIP Slots Casino. Hit “Autoplay” to open up the Jester’s Jackpot autoplay mode where you can select the number of spins (5, 10, 25, 50, 100, 250 or 500) and number of seconds between spins (1, 1.5 or 2). Stop settings are stop once all spins are complete, stop when jackpot is won, stop if a win exceeds or equals ($50, $100, $150, $200 or $250), stop on any win and stop if credits increase/decrease by ($50, $100, $150, $200 or $250). You can cancel autoplay on the Jester’s Jackpot video slot at any time. Jester’s Jackpot is a bland, very barebones video slot. For those who aren’t looking for any special features and just want a cheap video slot they can play to get some small wins on, Jester’s Jackpot will work fine. However, in today’s online casino world, almost every video slot has at least a wild symbol, almost always a scatter symbol if not scatter wins and usually something other than that. To play the Jester’s Jackpot video slot, sign up now at VIP Slots Casino! Are USA players able to play the Jester’s Jackpot online slot for real money? Yes, American players can play Jester’s Jackpot for real money at VIP Slots Casino, Super Slots Casino or any casino on our list of Vegas Tech casinos. Can I play a free Flash game of the Jester’s Jackpot video slot? While VIP Slots Flash Casino and Super Slots Flash Casino both offer a great selection of slot games, they don’t have the entire Vegas Tech library available. However, you can play several other Vegas Tech slots at those Instant Play casinos. Can I play the Jesters Jackpot slot online? Is there a flash version of Jesters Jackpot?